he is a great prospect, tall, bowls up to 140 and will certainly get quicker with time. Karnataka needs to play him in Ranji trophy more. Yes, Aggarwal deserves a chance but for Rohit may be or Dhawan? Where would you play him? He should open if he is playing but he we have two openers already who are likely to open for India in the next world cup. On current form you can only rest or drop Rohit. Khejroliya not playing since Ishant makes back into the team as he is the captain. Good that Asif is playing today. Khejroliya has been doing consistently well. Khaleel 6 overs 2 wickets for 14 runs vs Mumbai. Yes, I don’t know why thry made him captain. Could have easily made a batsman like Shorey the captain. Whats is his age and average speed? Why dont we have live hazare matches shown on tv? Too many games going on in early stages and they never get covered from the first round. Usually they do semi finals and finals of most domestic limited over tournaments. Its only challenger trophy in the past and SMA t20 trophy recently where they have shown interest in covering most games from a tournamrnt. We will most likeley see the last few games only telecast live. From growing up in Bangalore to training in Australia under Jeff Thompson, young Karnataka pacer Prasidh Krishna opens up about his journey. When Karnataka kicked off their campaign in September 2015, they were the undisputed champs in the domestic circuit. They had won back-to-back titles and were at the top of their game. As they lined up against the visiting Bangladesh A side at Mysore for a 3-day game, they were looking to take the game to an opposition that boasted a number of Test-level players in their ranks. The hosts had one concern though – their skipper, Vinay Kumar, wasn't fit enough to take the field. Someone had to step up, and the cap was handed to Prasidh Krishna. All of 19, the fast bowler was going to make his first-class debut against an international side. Bowling the second over in the innings, Prasidh ran in, delivered the first ball, and to everyone's astonishment, the unthinkable happened. Rony Talukdar edged it to second slip and the catch was completed. Prasidh had picked up a wicket off his very first ball on debut. As the game progressed, things only got better for him. He would go on to dismiss Anamul Haque, Liton Das, and Soumya Sarkar – all top-order batsmen in the Bangladeshi Test side. With figures of 5/40 from 12 overs, Prasidh was a revelation that day. Soon enough, the selectors took notice. The teenager had the potential to go a long way, and within no time Prasidh was on his way to Cricket Australia’s Centre of Excellence. It was a fairy tale journey for a boy who had grown up playing multiple sports in school. While India boasts of some superb facilities like the NCA and the MRF Pace Academy, it has always been considered a tremendous opportunity for any youngster to train in Australia, which reportedly has one of the best sporting ecosystems in the world. But that belief may not necessarily be true. The Bangalore boy has modelled his bowling on Brett Lee, who was his favourite bowler growing up. He also enjoys watching Kevin Pietersen and Mahendra Singh Dhoni bat, and he could very well one day fulfill his dream of bowling to one of them. 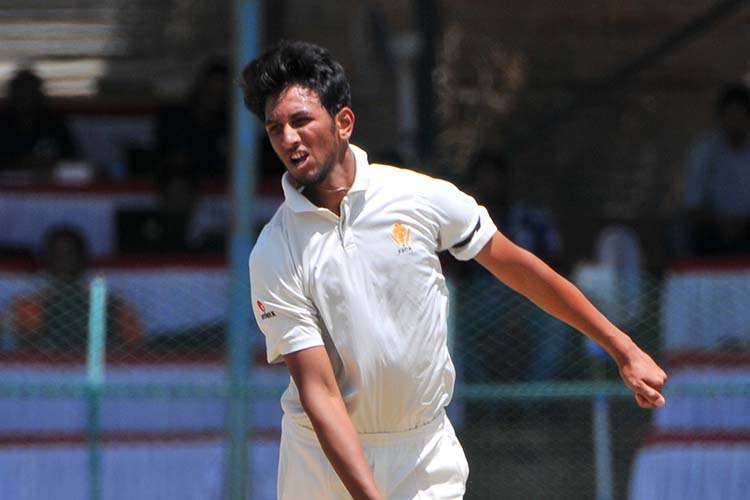 Prasidh made a terrific impact in the one first-class game he played and was immediately called up to the Karnataka Ranji squad, for whom he is still waiting to play his first game for. When probed about the importance of being patient, he mused, “I always believe in working hard and being patient, that’s my motto. Everyone works hard and when it comes to you not getting an opportunity because there are others ahead of you, some people lose focus and say I’m not lucky and all. On a lighter note, Prasidh remarked that he would have loved to have taken the wicket of Virender Sehwag if he had a chance. On his days off, he enjoys watching football, especially Manchester United games, being a fan of the club. He’s also a fan of gaming and loves playing Pro Evolution Soccer. It’s only a matter of time before we see Prasidh Krishna come charging in, with a red cherry in his hand, a plan in his mind, the words of McGrath and Thompson ringing in his ears, ready to strike. He’s been brought up the right way, he understands the value of patience, he knows that opportunity only strikes once at the door, and he has shown that he can make it count when he matters. There’s certainly a bright future ahead for him. How the champion in Virat Kohli did not let failure deter him. These players are definitely getting paid more than what they deserve. 5 players who clicked only in a single season of the IPL. A look at which team has hit the highest number of hundreds in the history of the IPL. AB de Villiers made a return to the squad after missing the first three games due to a finger injury. Will India ever return to play a game at these venues? The legendary Pakistan batsman expressed admiration for Kohli's batting method. Ashwin was bought by the Kings XI for Rs. 7.6 crore. Hardik Pandya's performance in the ongoing 6-match ODI series between Indian and South Africa has been below par. Kedar Jadhav has abysmal scores of 1,18, 12, 27 and 5* in his last five innings. These batsmen are an integral part of their respective sides. Reportedly, BCCI may allow prominent Indian players to participate in the proposed tournament. These players found their fortune in unfortunate injuries to players in the league. These bowlers have tormented batsmen in the death overs. Looking at the men who have effected the most dismissals from behind the stumps. They had the pace, they had the menace. However, they could never lead their nationals sides. Sharath but he lacked fitness. he has completely disappeared fromthe scene after injuries. every team has a one day gap between matches. Yes he has excellnt figures in domestics. Siddhesh Lad has impressive scores. No. Probably all teams will be playing back to back matches with an odd day of rest. Check the fixtures below. Good run-a-ball ardha shatak from PShaw. any channel showing this atm? Khaleel Ahmed 10-3-35-4 today against a strong Mumbai lineup. M Vijay has been left out of the Tamil Nadu side for the remainder of the Vijay Hazare Trophy after he "failed to report" to the ground for the game against Mumbai on Thursday due to "shoulder pain". The Tamil Nadu Cricket Association (TNCA) made it clear in a press release that the state body, the selection committee and the team physio were unaware of Vijay's injury. Dhruv Shorey is having a brilliant season. He has added another century, this time in limited overs. Not the most eye catching player at this time but his temperament needs to be commended. May be down the line can be seen as a test prospect in an year. He is still 25. Not sure about his t20 game yet, he can score in 50 overs. Hence I say, may be a long term Test player option. If he is having another good season next year, he should play for India A or somewhere. I would like to see him picked in Irani trophy where Vidarbha will play against Rest of India. 17 year old quick, Kartik Tyagi of UP , has picked up 6 wickets from 3 games so far. I mentiomed how crazy rate Rana was scoring runs at in Ranji, however now I stay away from hyping him because some silly icf folks will bring that I am only talking about Rana because he is from Delhi. Him and Krunal Pandya are two players who should have been tried by now in Indian ODI side. I can’t help when some Delhi players are so good and Indian prospect like Khejroliya, Pant, Rana etc. Saini and Sangwan both sitting out today of Delhi team. Good to see Khejroliya back. Probably rested. Delhi might have already qualified. Its been 3 games now when Thampi has been ignored by Kerala team. Thampi was picked for t20 squad couple of months ago for India, never got to play a game, and then dropped now for South African tour for the t20 series. He was in South Africa as a net bowler but easily forgotten for the t20 squad. Now he is not even being picked by his state side. Some cluless souls from state management to BCCi management. Ishan Kishan hit 93 of 96 balls opening the batting today. Thampi is a spray gun like Umesh. Rubbish on offer every over along with some good ones. He can play t20 since he can mange good yorkers. But in 50 overs game if he sprays he can cost a game. What evidence you have that he is a spray gun? He is young and just recently last year matured as a bowler and was picked regularly for Limited overs for Kerala domestic cricket team. He was impressive in IPL towards the closure of the tournament and hence got the emerging player of the year award too. You don’t earn emerging player award just like that. Then he was picked in the roster for India because of that performance. He is surely a better prospect then you make him out to be. One can’t be written off just like that. Gill gets a start today. Mandeep seems to be in good touch. I am thinking of hiring an advocate to help prepare for legal evidence. Thanks. Btw you should prepare for evidence where I said I am writing him off. You basically like to come and talk trash about any Indian prospect just after probably watching couple of clips. If you make effort to watch any of last year’s SMA trophy games you will see has the talent.